For the past decade, Apple has dominated the tech market with their sleek, stylish devices, leaving their competitors in the dust. But after years of living in Apple’s shadow, Microsoft is ready to step into the spotlight, bringing us innovative tech that outshines everything Apple has to offer. Microsoft loves to boast about the Surface Pro 4, saying that it has all the power of a laptop with the convenience and mobility of a tablet, and can you really fault them for it? But but it’s the upgraded pen that gets artists to take notice. 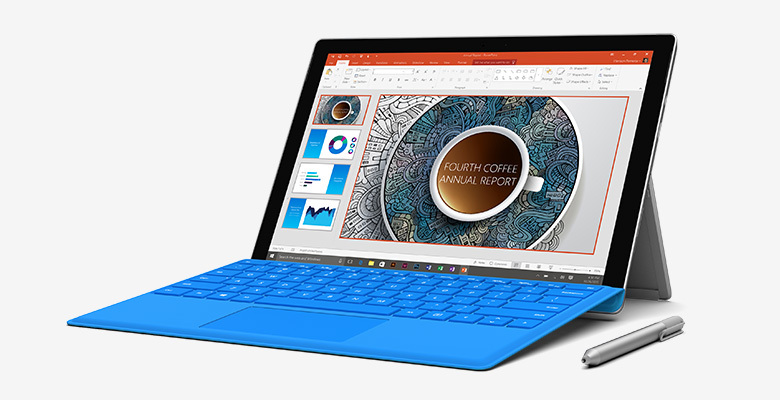 Capable of 1024 levels of pressure sensitivity, the Surface Pro 4’s pen comes in four colors, has interchangeable nibs that capture the feel of four essential artist’s pencils: HB, B, H, and 2H. The most exciting feature is the tail eraser, something Apple’s new stylus conspicuously lacks, especially since it’s called a ‘pencil.’ The eraser is one of three buttons included on the pen, along with a right-click button, and a dedicated one click to OneNote button. It’s all made possible by the otherworldly dynamic fulcrum hinge. Four rotational points roll out like a carpet as the laptop opens, extending the base by up to 20 millimeters. This gives the device balance while allowing it to remain thin and light. Underneath the laptop’s silver magnesium casing is a lightning fast Intel Core i7 processor 50% faster than the MacBook Pro, a battery that lasts up to 12 hours, and a 13.5 inch PixelSense™ display with crystal-clear resolution at 267 PPI. That’s 6 million delicious pixels as far as the eye can see. It’s also the first product ever to feature multiple graphics processing units. Keeping it all secure is Windows Hello. This remarkable program uses the Intel RealSense 3D camera to scan your face and iris, logging you into your computer completely password-free. 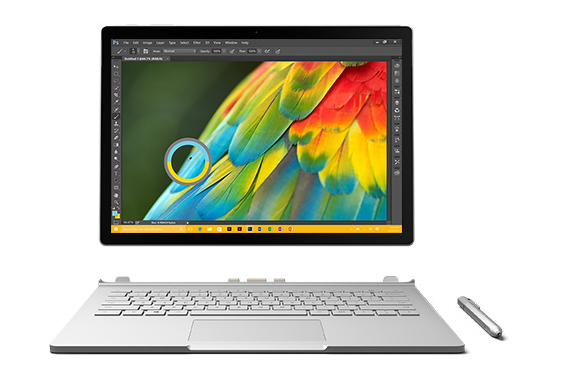 The Surface Book has hit the scene like an atom bomb. The most expensive model is already out of stock on Microsoft’s online store, although there is limited availability through Microsoft’s educational resellers. It’s clear that the Surface Pro 4 and the Surface Book are the one-two punch Microsoft needs to knock Apple out of the ring.